Some believe the future of video games lies in the web-based streaming of triple A titles. Others feel that game consoles and PCs will one day be replaced with mobile devices. Game industry luminary Jamil Moledina sees a future dominated by social action games that people can play regardless of platform. That's why Moledina has cast his lot with social gaming start-up Funzio, leaving a cushy position as the director of business development at EA's third-party publishing arm, EA Partners, to become Funzio's vice president of business development. It was not a move he took lightly. "Leaving EA was a really hard decision for me," Moledina explained to me during an interview late last week in advance of today's announcement. At EA Moledina was instrumental in creating the EA Partners' third party digital publishing business, helping small developers with brilliant new ideas find an audience. For a man whose career has focused on identifying and developing emerging talents, it seemed like the perfect position. So why make a change? "The move is entirely about Funzio...where they are right now." 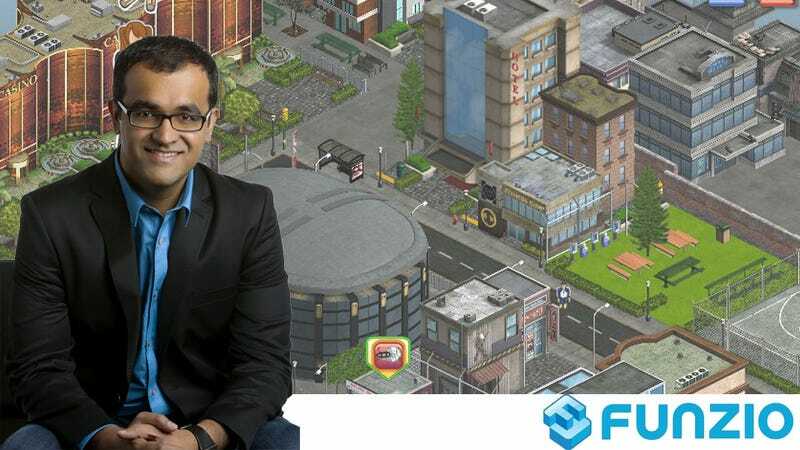 Where Funzio is right now is a blossoming social gaming company with a huge multi-platform hit on their hands in the form of Crime City. A fresh take on games like Mafia Wars, Crime City launched on Facebook in September of 2010. Since release it's gathered more than 7.5 million monthly players and the highest rating of any Facebook game with more than 600,000 users — 4.9 out of 5. In August, Crime City became one of the first games available on Google Plus. The iOS version of Crime City, also released in August, was downloaded more than one million times in five days. And that's where Funzio is that Moledina wants to be. Five years from now he says the successful game companies will be creating compelling social gaming experiences free from constraints of platform, price, or technology; games like Crime City. "Funzio is the one start-up working to deliver on that order," Moledina said. "Working to overcome platforms as a defining characteristic." He gives the example of streaming video service Netflix. You can now watch your movies on just about any device, from your mobile phone to your gaming console. Why shouldn't our games work the same way? "It's relatively ubiquitous. An incredibly attractive goal for the industry, and Funzio has the building blocks to get there." And so Jamil Moledina steps into a new role, just as he did when he left his role as the executive director of the Game Developers Conference to purse other interests back in 2008. "There has comes a point where you have to believe in your own vision of the industry." Not content to wait for his vision of gaming's future to come to pass, Jamil Moledina is taking an active role driving and inventing that future.